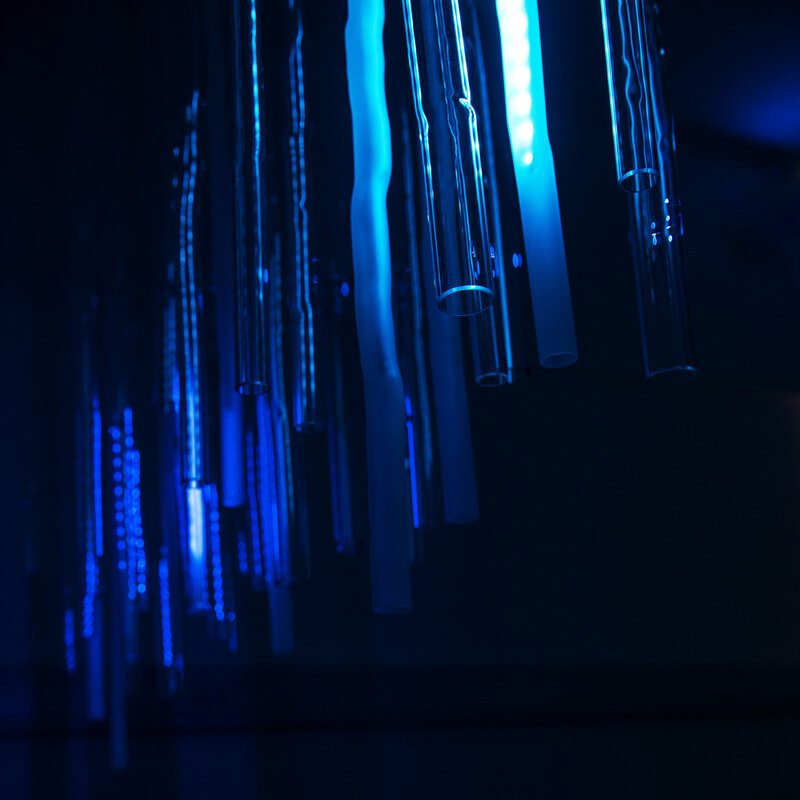 An interactive lighting installation inspired by the rain. There is a moment that follows the rain, when water has stopped pouring from the clouds, leaving behind thousands of tiny droplets hanging to the leaves and branches. The whole natural world seems alive. There is tension in the air from the trees loaded with water drops on the point of falling, a fragile balance that can be easily broken by a sudden movement,; by walking through the leaves or shaking them. But if you stop there for a moment, if you remain still and silent, the world will slowly adapt to your presence, and the drops will start falling, softly, and gently again, as you become part of the living environment. Notturno is an interactive glass and light installation that tries to capture the essence of this moment. Water is the core inspiration of this project. By using glass to shape light Notturno tries to capture precise impressions inspired by this element: drops flowing rapidly down the leaves, the tension before they fall. How they cannot be seen for a moment as they plunge through the air. The splash they create when they hit the ground or dissolve with a ripple in a pool of water. The concept underlying Notturno is the idea of making light flow from top, to bottom elements, recreating the effect of rain drops streaming down the plants and then dropping to the ground. The composition is designed to recall specific, realistic characteristics of the rain. The top glass elements represent the fluid movement of drops on leaves and branches. The bottom glass elements capture the moment when the drops hit the ground. A glowing base lights the pieces from below, reminding the viewer of surreal pools of rippling water. The project explores the different ways glass reacts to light - how it glows magically through cast glass and highlights the edges of blown glass elements - combining these two glass making techniques, bringing to life pools and splashes of water. 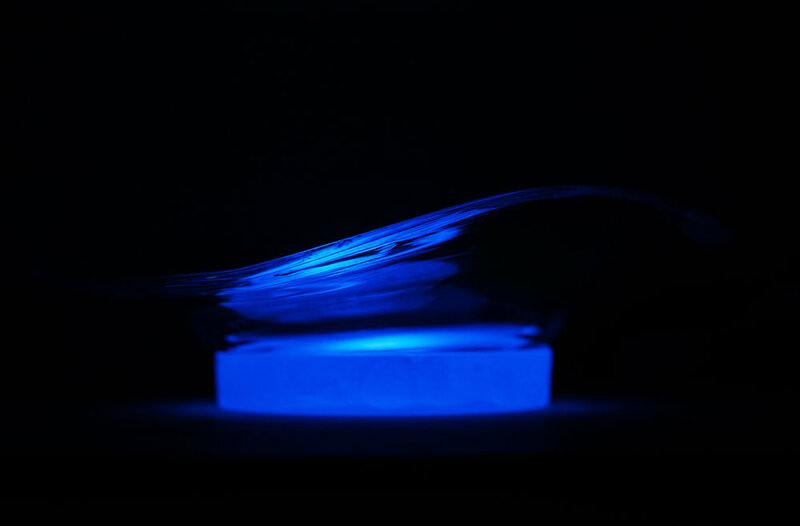 Glowing droplets of light, in dreamy shades of blue, flow down fourty distorted glass tubes, stopping when they reach the tips, before plunging into three blown glass forms at the base of the piece. The drops create ripples in the LED panels hidden inside the plinth, which light up the thick cast discs generating a surreal, watery glow. The light diffused from the cast bases, catches on the edges of the splashes, creating glowing waves that seem suspended in mid air. This installation is the result of a combination of different processes. Glass in its various forms is the main material of the piece. Its diverse qualities are explored thoroughly, and enhanced through the use of digital technologies. All the fittings and supports used in the piece are 3D printed or laser cut. The light in Notturno comes from nine meters of LED strip and three LED panels with more than a thousand LEDs each. 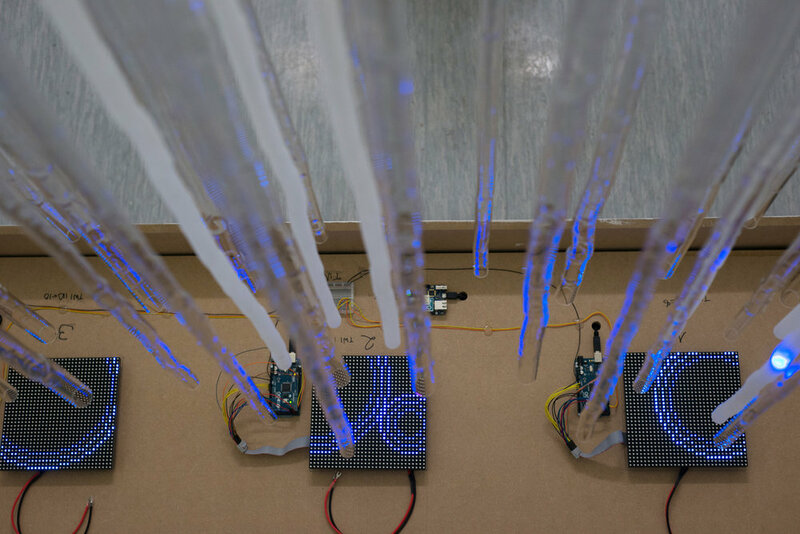 The whole system is controlled by different Arduino boards that synchronize thedrops of light coming down the strips with the ripples generated on the panels. A sensor responds to movement increasing the frequency of the drops, and then gradually slowing them down again as everything returns still. For videos of Notturno visit my Instagram page or my blog on Tumblr.